Posted on 13 April 2007. Congratulations to Jean Bakkom, winner of the Community Service Award presented by the Captain Christian Brown Chapter of the Daughters of the American Revolution. This is a national DAR award recognizing “worthy residents from a variety of walks of life for unpaid voluntary achievements in cultural, educational, humanitarian, patriotic, historical, and citizenship endeavors, or in environmental conservation,” according to the Chapter. Jean was honored for her work for the Sharon Springs Free Library. She was nominated for the award by Harriet Berard, DAR member and trustee of the Community Library in Cobleskill and MVLS. Harrie Washburn, former Mayor of Sharon Springs, was also honored for his assistance in acquiring the old bowling alley. 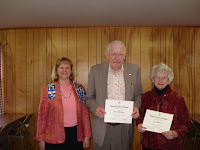 Pictured above (l to r): Priscilla Davis, DAR Vice Regent and Program Chair; Harrie Washburn; Jean Bakkom.